Remove from food processor and work together into 2 balls. Wrap in plastic wrap and place in fridge for at least 4 hours. TIP: According to Mary, overnight works better. Roll one ball out onto a flat, floured surface until its diameter is slightly larger than your pie plate. Place the dough into the bottom of the pie plate and press it down around the inside of the plate. Crimp around the edge of the crust with your thumbs or a fork. TIP: Roll the crust on floured parchment paper or greased plastic wrap and use the wrap/parchment to move the crust over to your pie plate. TIP: Place a piece of parchment on top of the crust and fill it with pie weights (dried garbanzo beans or rice also work) to keep it from bubbling and lifting. Or you can prick the crust all over with a fork and prick any bubbles that come up while baking. Bake in oven for 10-15 minutes. It will continue to brown after you remove from the oven, so do not over bake. Fill pie with your favorite filling – in this case it was lemon. TIP: Shirriff Lemon Pie Filling mix is gluten free (although there may be a risk of cross contamination). Top with meringue or whipped cream. TIP: This crust would also work well for this banana cream pie. 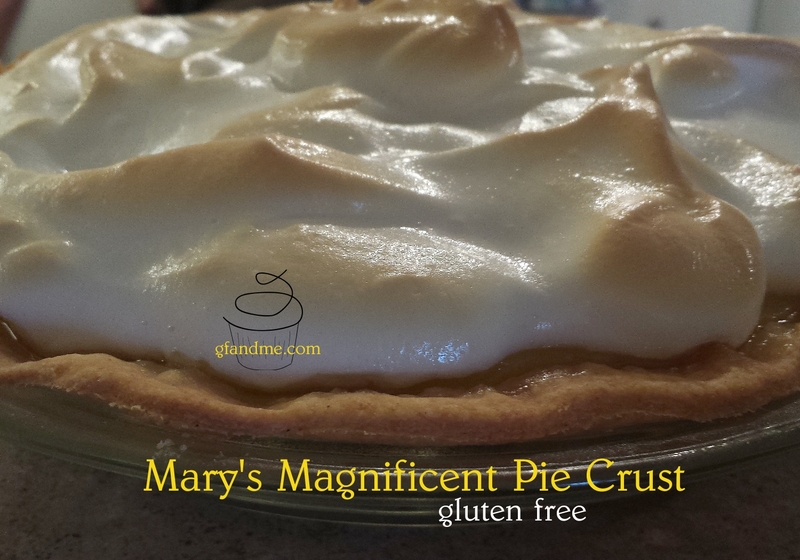 This entry was posted in Baking, Drinks & Desserts, Recipes and tagged bob's redmill gluten free all purpose flour, Christmas, Dr. Oetker, gluten free, pastry, pie crust, Shirriff lemon pie filling, thanksgiving. Bookmark the permalink. I know. She’s the best. Thanks for dinner last night. Wow that sounds great. Am going to give it a go- have tried quite a few GF pastries and none have turned out- this looks more promising though! It is really good. Most people don’t realize it’s gluten free. Looks fab, I haven’t tried a gf pastry using sour cream yet so have popped it on my ‘to do’ list. It did seem to be the magic ingredient. Mom tried many, many kinds of gf pastry recipes and then she hit on this one. Yes, Mary is one and the same! And no we have never tried cream cheese – but I bet it tastes fabulous! – so I can’t say whether you could just replace one for the other.